Argos Panoptes was one of the primordial giants of the Greek mythology. His epithet ‘Panoptes’ means the one who is all-seeing, which reminds us of the symbol of the ‘all seeing eye’ of God. However, Panoptes was an epithet that was also used for the god Zeus. Argos Panoptes was the son of Arestor, whose wife was Mycene from whom the Mycenaean civilization and the Homeric city of Mycenae got its name. Argos is described as having 100 eyes, according to the Greek mythology. Probably this was a feature attributed to him in an allegoric way, showing his ability to perceive everything from any angle. Whenever he slept not all of the eyes would be closed, there was always at least one eye open. He is usually depicted with multiple eyes on his body (see image above). As we can see, even if he was mentioned as a ‘monster’ in reality he was a giant, a god, with super abilities. Argos was helpful to people by killing many monsters that would create problems for the citizens of Peloponnese (an area in Southern Greece). Nothing bad is said about him in the ancient texts. One of Argos’ greatest achievement was to kill Echidna, and ancient monster that was half snake half woman, which is known as the ‘Mother of All Monsters’ – for a reason. Her children were some of the most famous monsters: Cerberus, the Sphinx of Thebes, The Lion of Nemea, the Lernean Hydra and many others. Echidna was a goddess, half nymph, immortal and ageless, daughter of Tartarus and Gaia, a drakaina – a female dragon, who lived inside a deep cave. Even if she was a dragon, she had the support of the Olympian gods. She was of the first generation of gods, wife of the 100-headed Typhon, but Zeus allowed her to live after Typhon was punished and sealed under Mount Etna. The gods gave Echidna a glorious house to live in according to Hesiod’s Theogony. At some point, the goddess Hera assigned a new role to Panoptes, to guard the Mistress of Zeus, Io, who the god Hera transformed into a cow. His role was to guard her from Zeus, keeping her chained to an olive tree. However such a role, keeping the lustful Zeus away from his mistress (one of many) wouldn’t have had a good end. 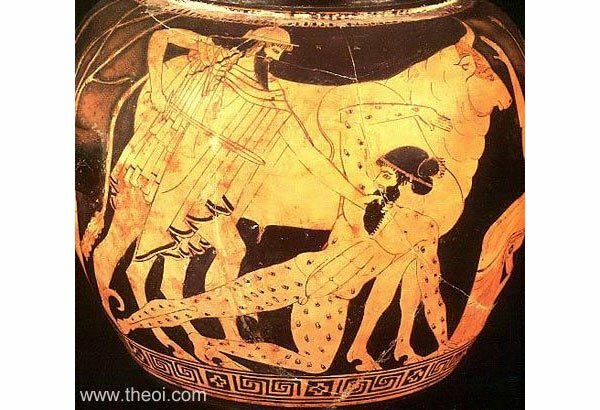 Zeus asked the god Hermes to steal goddess Io from Panoptes. Hermes disguised as a shepherd, approached Argos, and then he put him to sleep using spells through his music and then he slew him. I wish the author wouldn't play with the English language. Hera was a goddess not a god. Please remember that. I don't think it's "playing with the english language". Hera is referred to in the singular as a "goddess", but when referred to in the plural along with the rest of the ancient deities, she becomes one of the "gods". That follows the rule of the grammatically masculine version of a word being the default.